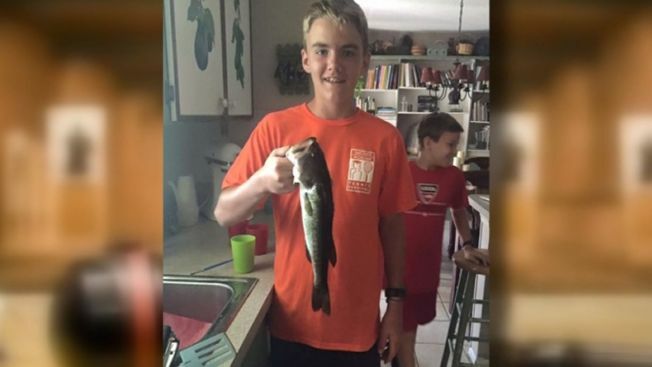 A Florida man who authorities say accidentally shot and killed his 14-year-old son at a shooting range is blaming himself -- not the gun -- for the death. Clayton Brumby, 64, told the Tampa Bay Times a smoking hot shell casing went down the back of his shirt, causing him to flail both arms in the air Sunday afternoon at High Noon Guns, where the Sarasota family had gone for shooting practice. His finger was still on the trigger, which fired. He heard his 24-year-old son yell, "Dad, Stephen's been shot." The bullet from the .22-semi-automatic Ruger SR22 ricocheted off the ceiling and struck the teen in the jugular vein, Brumby told the newspaper. "The gun didn't kill my boy," Brumby said. "I did." Brumby said the gun belonged to his 12-year-old daughter. Brumby said he has been shooting for about three years. Stephen took up shooting about 18 months ago and his father says he was "a natural" who would "shoot anything." Brumby's version of events differed slightly from the one offered by the Sarasota County Sheriff's Office. Deputies based their account on what witnesses told them. According to the report, Brumby tried to remove the casing, which had bounced in the back of his shirt, with his right hand, which also held the weapon. "While doing so, he inadvertently pointed the firearm directly behind him and accidently fired," the sheriff's report said. Brumby said he preaches gun safety. "That's why yesterday was so stupid and freaky on me because the gun is supposed to be pointed down range at all times," he said Monday. "My first thought was 'That was pretty stupid of me. I should've put the gun down.'" Sarasota County Sheriff's officials are calling the shooting was accidental. As of Monday, no charges were planned.